I love the combination of pears and chocolate, it is so nice. This is a fancy looking dessert, that tastes as good as it looks. This is a very simple dessert. 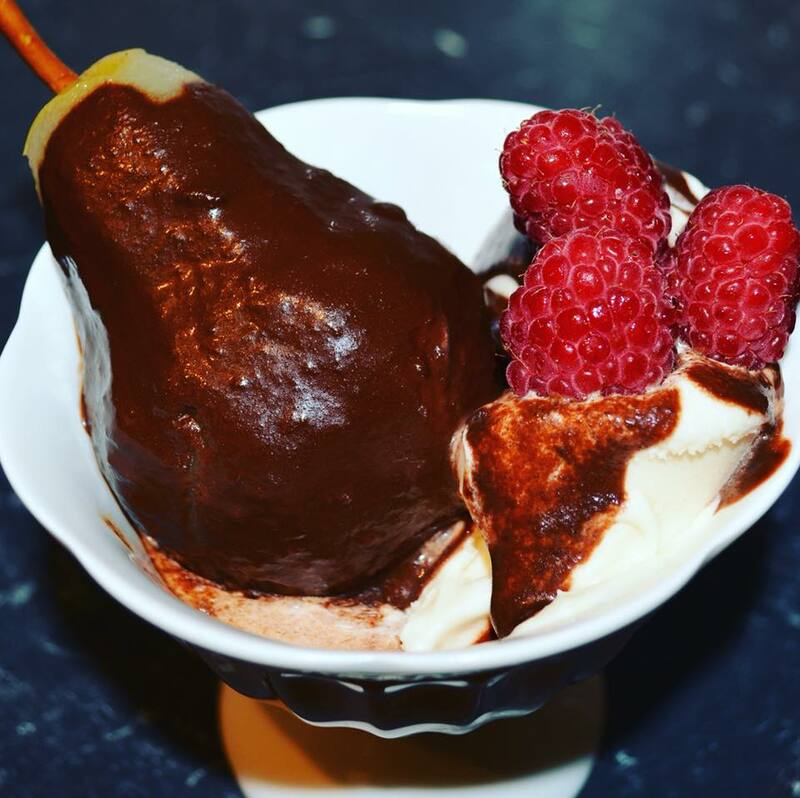 The poached pears can be made up to 2 days in advance, and the chocolate sauce can be made earlier and left out of the refrigerator (covered with cling film) until needed. The first time I made this my chocolate sauce was quite thin, but what was leftover got thicker just by sitting on my kitchen bench, so next time I make it, I may make it a little earlier, and allow it to thicken a bit. The flavour is the same, but when thicker it coats the pear better. Also do not heat the syrup too much, you really do need to get it off the heat before it gets to a simmer. If when you add the syrup to the chocolate it is grainy, just place your chocolate in a heatproof bowl and place over a pan of simmering water and stir until it is no longer grainy. Choose the best possible vanilla ice cream you can afford. I always buy my favourite ice cream when on sale as some are quite expensive at full price, then I buy a few and enjoy it until the next sale. Poaching pears is quite easy. I buy firm ones, not rock hard, but firm, as if you buy ripe ones, they are too soft to peel, and are mushy. So I will give you a guide about how long to poach the pears, but if they are not soft after that time, poach until they are. I don't discard the syrup, I save it and add it to some cocktails that need sugar syrup. Cartouche: I like to scrunch up the baking paper and place under running water to soften it slightly, then I place it over the pears. I also poached 5 pears instead of 4, as there are 5 of us, so just add an extra pear if you need it. Peel the pears, rubbing the peeled surface with the cut lemon as you go to prevent them from browning (although if you work quickly, you don't really need to rub on the lemon). Place the pears in the sugar syrup, cover with a piece of baking paper (cartouche). Place back on the heat, bring it to a simmer and simmer for 20-30 minutes or until a skewer inserted into a pear enters easily. Don't rush this as a hard poached pear will ruin the dessert. Remove the pan from heat and leave the pears to cool in the syrup for an hour. After an hour place the pears in the syrup in the refrigerator until needed. If using almonds, place baking paper on an oven tray, scatter over the almonds. Toast in a preheated 180C/160C fan forced oven for 3-4 minutes or until golden. Remove the pears from the syrup (reserve the syrup). Using a teaspoon and working from the base of the pear, carefully scoop out the core and seeds, and discard. To make the chocolate sauce, place 150ml of the reserved syrup in a small saucepan over low heat and bring to just below simmering point. place the chocolate in a heatproof bowl, pour over the hot syrup and stir until the chocolate sauce is melted and smooth. If using the Chantilly cream: Place the cream, vanilla seeds and sugar in a bowl, stir to combine. Whisk the cream until soft peaks form. 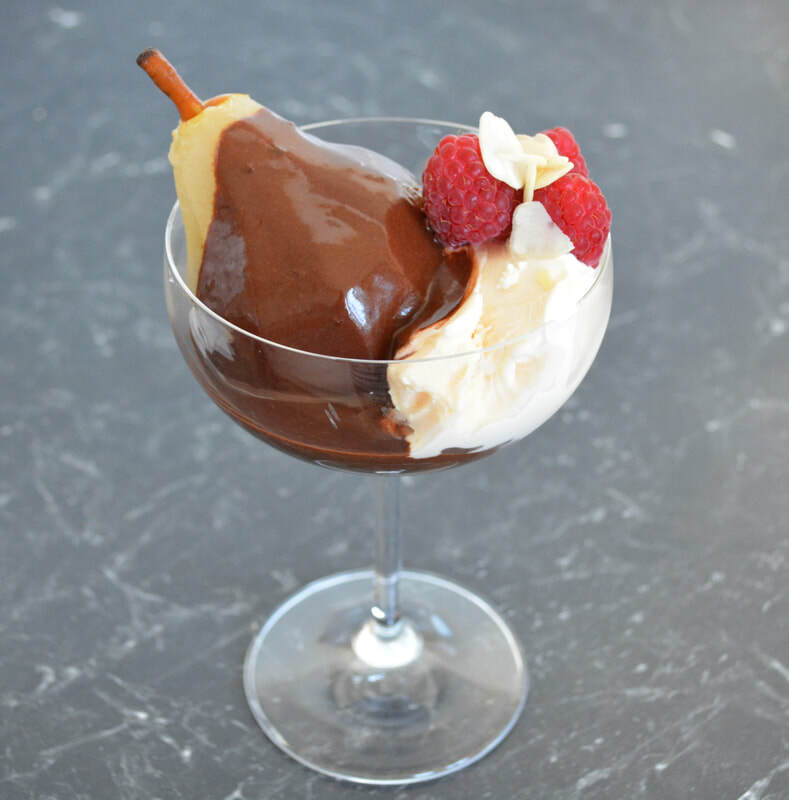 To serve, Place a pear into each of the 4 serving bowls or glasses, pour over the chocolate sauce. Place a small scoop of ice cream to the side of the pear. If using, add a dollop of Chantilly cream, and sprinkle the toasted almonds on the Chantilly cream. Serve immediately.